The exhibition currently scheduled at Palazzo Strozzi in Florence, entitled “Americans in Florence. 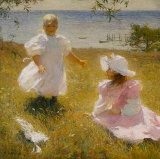 Sargent and the Impressionists of the New World “deals with the strong link between the world of intellectual and artistic American world and Florence and Tuscany in the period from the late nineteenth century to the early twentieth century. 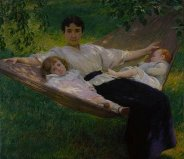 Displayed, divided into six thematic sections, both American artists of Impressionist imprinting who stayed in Florence, first of all John Singer Sargent, and Tuscan artists closed to the cosmopolitan American “Florentine” community. The first section “Room with a View” houses “The hotel room” by John Singer Sargent ,a painter that despite his being born in Florence, was always preferring stay in hotels. The work of the years 1904-06 shows a hotel room with an opened suitcase on the floor. or “il Villino Batelli a Piagentina” from 1863 by Silvestro Lega. portrayed in 1884, two years before her untimely death, by Michele Gordigiani. The core of the exhibition, are the portraits of Tuscan and Florentine by birth or by election society frequented by John Singer Sargent. Here the portrait of Henry James that, as Sargent did, decided to live in Europe. and that of Maria Piccolellis d’Aragona by Ernestina Fabbri, Egisto’s sister, dated 1889.
by Frank Weston Benson dated 1899 where are portrayed his daughters. Interesting concept for an art show. Would love to see it here in the U.S. as well.